Justice Butz was born in Auburn, California in 1950. She spent her junior year of high school as an American Field Service (AFS) International exchange student to Brazil. She graduated from Placer Union High School in Auburn in June 1968. Following graduation, she attended the University of California at Davis, where she obtained her B.A. degree in 1972. After working for several years in the School of Engineering and Shields Library at the University of California at Davis, she attended the UC Davis School of Law. She obtained her J.D. from that school in 1981. She was admitted to the California Bar on June 10, 1982. Justice Butz was in private practice in Nevada City, California, from 1982 to 1996. During that period she was an associate in the law firm of Berliner & Spiller, and partner in the successor firm of Spiller, McProud, Butz & Kraemer. On November 5, 1996, she was elected to the Nevada County Superior Court. She was reelected to a second term in 2002. She served as presiding judge of the Nevada County Superior Court in 2001-2002, presiding judge of the Family & Juvenile Court for Nevada County in 2003, and supervising judge of the Nevada County Civil Grand Jury from 1997 to 1999. As a trial judge, she presided over civil, criminal, probate, family, and juvenile delinquency and dependency cases. 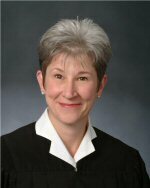 In October 2003, Justice Butz was elevated by Governor Gray Davis to associate justice in the Court of Appeal, Third Appellate District. She was retained by California voters in 2006 and 2010. Justice Butz has served as an instructor of judicial education for the California Center for Judicial Education and Research (CJER) and the B. E. Witkin Judicial College of California (1998-2003). She served as chair of CJER's Rural Courts Education Committee (2003-2004) and as a member of the Appellate Justices Education Committee (2004-2009). She served as a member of the Judicial Council's Appellate Indigent Defense Oversight Advisory Committee (2005-2016), CJER's Appellate Practice Curriculum Committee (2010-2012), and the Executive Board of the California Judges Association (2011-2014). She has Chaired the Appellate Mediation Committee of the Third District Court of Appeal from 2011 to the present. Justice Butz is a Past President of the Schwartz / Levi American Inn of Court, an organization promoting civility, ethics, and professionalism in the legal profession (2012-2015). Married with a large extended family, Justice Butz is an avid reader, and enjoys travel and leisure time with family and friends.